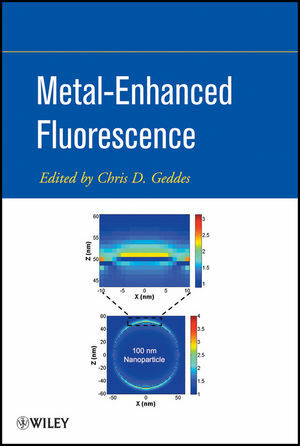 This book collects and analyzes all the current trends, opinions, and emerging hot topics in the field of metal-enhanced fluorescence (MEF). Readers learn how this emerging technology enhances the utility of current fluorescence-based approaches. For example, MEF can be used to better detect and track specific molecules that may be present in very low quantities in either clinical samples or biological systems. Author Chris Geddes, a noted pioneer in the field, not only explains the fundamentals of metal-enhanced fluorescence, but also the significance of all the most recent findings and models in the field. Following a discussion of the principles and fundamentals, the author examines the process and applications of metal-enhanced fluorescence. Throughout the book, references lead to the primary literature, facilitating in-depth investigations into particular topics. Guiding readers from the basics to state-of-the-technology applications, this book is recommended for all chemists, physicists, and biomedical engineers working in the field of fluorescence. CHRIS D. GEDDES, PhD, is a Professor at the University of Maryland Baltimore County, where he is the Director of the Institute of Fluorescence, and the Editor in Chief of both the Journal of Fluorescence and Plasmonics. With more than 190 papers and eighteen books to his credit, Dr. Geddes has extensive expertise in fluorescence spectroscopy, particularly in fluorescence sensing and metal-fluorophore interactions. Mental-Enhanced Fluorescence: Progress Towards a Unified Plasmon-Fluorophore Description (Kadir Aslan and Chris D. Geddes). Spectral Profile Modifications In Metal-Enhanced Fluorescence (E. C. Le Ru, J. Grand, N. Félidj, J. Aubard, G. Lévi, A. Hohenau, J. R. Krenn, E. Blackie and P. G. Etchegoin). The Role Of Plasmonic Engineering In Metal-Enhanced Fluorescence (Daniel J. Ross, Nicholas P.W. Pieczonka and R. F. Aroca). Importance of Spectral Overlap: Fluorescence Enhancement by Single Metal Nanoparticles (Keiko Munechika, Yeechi Chen, Jessica M. Smith and.David S. Ginger). Near-IR Metal Enhanced Fluorescence And Controlled Colloidal Aggregation (Jon P. Anderson, Mark Griffiths, John G. Williams, Daniel L. Grone, Dave L. Steffens, and Lyle M. Middendorf). Optimisation Of Plasmonic Enhancement Of Fluorescence For Optical Biosensor Applications (Colette McDonagh, Ondrej Stranik, Robert Nooney and Brian D. MacCraith). Microwave-Accelerated Metal-Enhanced Fluorescence (Kadir Aslan and Chris D. Geddes). Localized Surface Plasmon Coupled Fluorescence Fiber Optic Based Biosensing (Chien Chou, Ja-An Annie Ho, Chii-Chang Chen, Ming-Yaw, Wei-Chih Liu, Ying-Feng Chang, Chen Fu, Si-Han Chen and Ting-Yang Kuo). Surface Plasmon Enhanced Photochemistry (Stephen K. Gray). Metal-Enhanced Generation of Oxygen Rich Species (Yongxia Zhang, Kadir Aslan and Chris D. Geddes). Synthesis Of Anisotropic Noble Metal Nanoparticles (Damian Aherne, Deirdre M. Ledwith and John M. Kelly). Enhanced Fluorescence Detection Enabled By Zinc Oxide Nanomaterials (Jong-in Hahm). ZnO Platforms For Enhanced Directional Fluorescence Applications (H.C. Ong, D.Y. Lei, J. Li and J.B. Xu). E-Beam Lithography And Spontaneous Galvanic Displacement Reactions For Spatially Controlled MEF Applications (Luigi Martiradonna, S. Shiv Shankar and Pier Paolo Pompa). Metal-Enhanced Chemiluminescence (Yongxia Zhang, Kadir Aslan and Chris D. Geddes). Enhanced Fluorescence From Gratings (Chii-Wann Lin, Nan-Fu Chiu, Jiun-Haw Lee and Chih-Kung Lee). Enhancing Fluorescence with Sub-Wavelength Metallic Apertures (Steve Blair and Jérôme Wenger). Enhanced Multi-Photon Excitation of Tryptophan-Silver Colloid (Renato E. de Araujo, Diego Rativa and Anderson S. L. Gomes). Plasmon-enhanced radiative rates and applications to organic electronics (Lewis Rothberg and Shanlin Pan). Fluorescent Quenching Gold Nanoparticles: Potential Biomedical Applications (Xiaohua Huang, Ivan H. El-Sayed, and Mostafa A. El-Sayed).